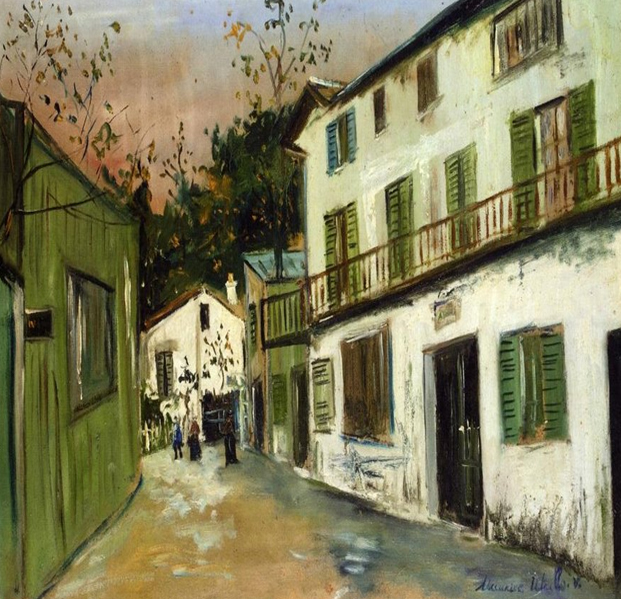 Maurice Utrillo painted Post-Impressionism cityscapes and was attracted by ordinary houses and suburban churches. These themes, associated with painters such as Daumier, Pissaro and Caillebotte, became Utrillo's chief source of inspiration, but he soon turned to a more ambitious subject—cathedrals. He was concerned with the development of an ordered composition and a flattened treatment of space that suggested the artificial appearance of theatre. During World War I he found that such subjects allowed him to project strong emotions. From 1909 until 1914 Utrillo mixed glue, plaster or cement with his paint to obtain the whites for which he became famous. His paintings of buildings show a striking contrast between the boldness of his color and his painstaking draughtsmanship (traces of his having used a ruler and compass are often noticeable). Carried to their logical conclusion, these experiments led him to produce austere monochrome paintings in beige and grey. Maurice Utrillo was born in Paris, on the 26th of December 1883 to the French painter Suzanne Valadon. His mother posed as a model for such painters as Renoir and Puvis de Chavannes before discovering her own talent for drawing and painting. His father, the Spanish painter Miguel Utrillo (1862-1934), only admitted paternity eight years after Maurice's birth. Utrillo had no predisposition for art, but when he was 19 his mother urged him to adopt drawing and painting as to distract him from his need for alcohol. In search of a suitable subject, he went to the countryside around Montmagny, a village to the north of Paris. There, between the autumn of 1903 and the winter of 1904, he completed almost 150 paintings—somber, heavily impasto landscapes as the Roofs of Montmagny (Paris, Pompidou). By 1906 the doctor felt that Utrillo could return to Montmatre. His pictures of the streets and suburbs were painted with a less heavy impasto and with lighter tones. His deteriorating health and social awkwardness led him gradually to withdraw from the streets of Montmartre into the relative safety of nursing homes. Here he developed the habit of painting from postcards. His stepfather, the painter Andre Utter (1886-1948), and his mother selected cards that reproduced his favorite views of la Butte Montmarte. He worked from these in their communal studio at 12 Rue Cortot, in the restaurant La Belle Gabrielle or in a bedroom above the Pere Gay bistro. He exacted his revenge on the locals, who had made his life difficult with their criticisms and jokes, by depicting them in his paintings in rear view as heavily outlined clumsy shapes and stereotyped silhouettes. His late paintings are characterized by rich colors and strong black contours and are based almost entirely on landscape themes. From 1937 on his friend and dealer Paul Petrides looked after him at the request of his family. In spite of his wretched life he maintained a prolific output with a deep vein of poetic melancholy. He died in May 1955. His critical reputation declined posthumously, although he remained popular with collectors and the public. The Blog Tour will be on the 31st. Our Sponsors this month are Heather Wynn and Mary Harding. 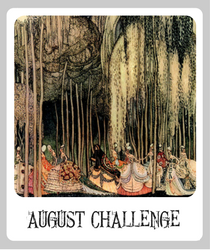 This looks like an interesting challenge! I always find the buildings extra-difficult! There is much to work with here though! Finally!!! I have the perfect thing for this! I participated one time over a year ago. I'm so excited to do it again now! Love the inspiration for this month! I've just made an art bead inspired by the colours. Should be fun! All the components just fell into place. Yeah. Looking forward to see what is created this month. I finally finished a piece for the challenge--the first this year! http://attorneyangelalundlogan.blogspot.com/2012/05/italian-ice.html is the address for my blog post about my May ABS challenge entry. Here's my post for my ABS entry! I made a bracelet for this months challenge. It is the leaf bracelet towards the middle of the post. I can't wait to see everyone's creations! I've stayed out of the Flickr pool so far since my ideas were still floating a bit. Well after several starts I'm still figuring it out. But nothing like a deadline to snap some focus on things. I really enjoyed working on this piece. All created handmade by me. Thank you ArtBeadScene for having this every month. I love working outside the box and challengeing myself. Thanks, I really enjoyed working with this painting! (Of course, I ALWAYS love the artwork selected!) Thank you for continuing to host!